Organisms have evolved to co-ordinate their activities according to the Earth's rotation, its revolution around the Sun, and the Moon's revolution around the Earth. Table 10-02 is a summary of the various types of biological rhythm. Biological cycles were thought to be passive, driven by environmental cues such as changes in light and temperature. It is only in the late 1990s that an internal-clock more or less independent of external environment was identified at molecular level. Figure 10-16a depicts the daily rhythm of a typical individual. It shows that there is a cyclic variation for most of the biological functions, which attain their high or low point at certain time each day. paraventricular nucleus to relay a "secrete melatonin" signal (green arrows) through neurons in the upper spine and the neck to the pineal gland. 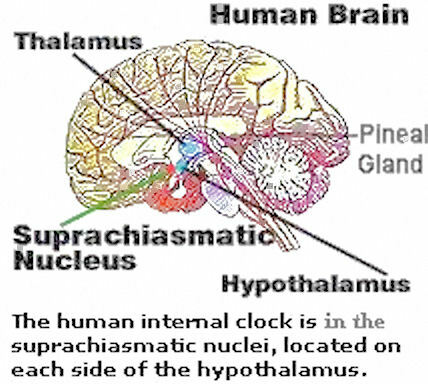 It is now known that there is an internal-clock mechanism working at the molecular level. Interaction of four regulatory proteins, entrained by light (the reset can be at most six hours), creates the daily rhythm for a wide range of organisms, from fungi to fruit flies to mammals. The cycle begins in the cell nucleus, where special initiator genes are in the "on" position (the default). The initiator genes produce the proteins "CYCLE" and "CLOCK". They form a complex and bind to the E-box in the DNA coding the "PER" (period) and "TIM" (timeless) proteins. This process runs continuously until it is inhibited by the "TIM/PER" complex. mRNAs for the proteins PER and TIM are transcribed. The mRNAs move out to the cytoplasm and make the PER and TIM proteins. The "TIM" protein is degraded in the presence of light and so its concentration level is low during the day. This has important implications since it means PER can't accumulate either. 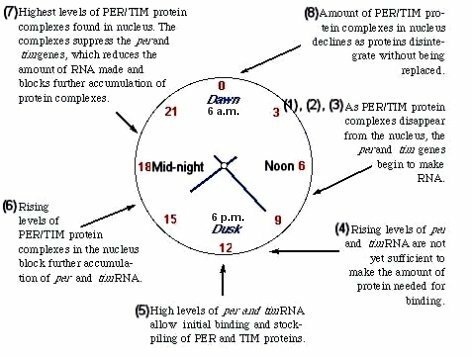 It is because PER is degraded by another clock protein "DBT" (double time) when the PER is not bound to the TIM/PER complex. This is the crucial step to delay the cycling, otherwise the oscillatory period would be much less than 24 hours. When the PER and TIM proteins reach a certain concentration in the cytoplasm as day turning to night, they begin to bind in pairs. These PER/TIM complexes have a shape that allows them to enter the nucleus. 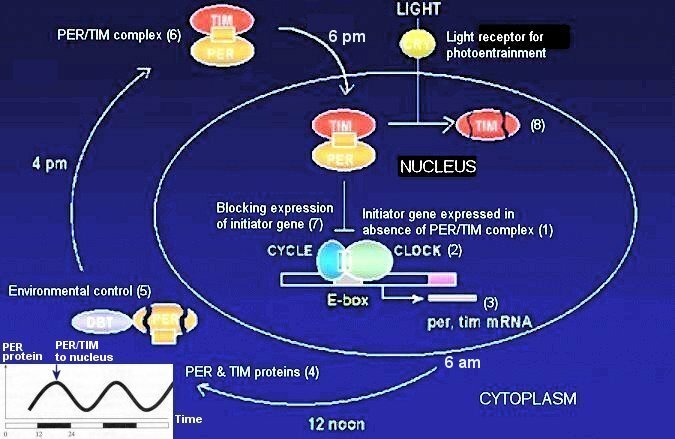 Once inside the nucleus, the PER/TIM complexes block the operation of the initiator genes so they can no longer activate the clock genes that generate these very proteins in the first place. With the clock genes switched off, the whole process comes to a halt. This is a negative feedback loop, which produces a stable process (a positive feedback loop on the other hand would produces a runaway process). The PER/TIM complexes gradually dissipate in the nucleus, probably eliminated by an enzyme as night turning to day. Once the complexes have vanished, they no longer block the initiator genes, which then switch the clock genes back on, allowing the cycle to start anew. The initiator genes can also be switched back on by the interference of light (photo-entrainment), which destroys the TIM protein and hence the TIM/PER complex. 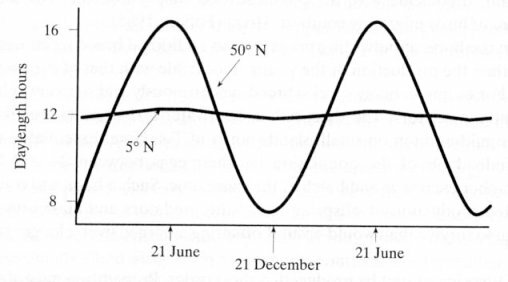 Figure 10-17b shows the timing of the events in 24 hours cycle. also be regulated by the circadian clock, which is equipped to keep track of the length of days and nights. To be of any biological use, the above-mentioned 24-hour molecular cycle has to be turned into a signal that can regulate physiology and behavior. 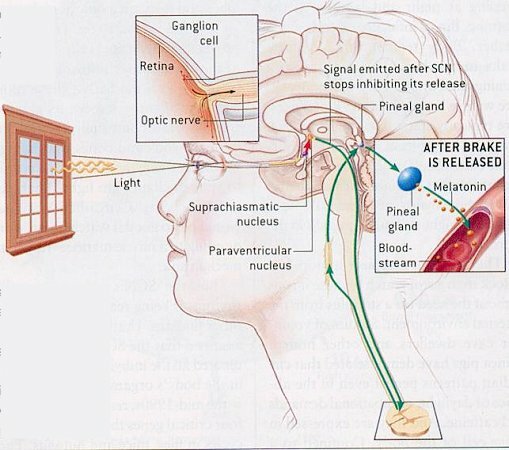 For example, the SCN shows a 24-hour rhythm in electrical activity that drives output rhythms such as melatonin from the pineal. It is found that within the SCN there is a group of what are called "clock-controlled genes" or ccgs, which are driven by the molecular oscillation. This rhythmic transcription seems to involve the same basic elements that drive the molecular feedback loop, with a CLOCK/BMAL1 complex binding to the E-box element instead of CLOCK/CYCLE. One of these ccgs is the gene for the neuropeptide arginine vasopressin (avp). In the SCN, avp has a strong circadian rhythm in both its mRNA and protein abundance. It increases the electrical activity of many SCN neurons. SCN also releases avp in a rhythmic manner to alter the activity of cells outside the SCN. Further researches indicate that the molecular basis of the clock in plants, fungi, and bacteria is different from that in mammals and insects. It seems to suggest that the biological clock may have evolved multiple times during the course of evolution. In summary, although different sets of genes seem to generate the clock in animals, plants, fungi and bacteria, they use the same fundamental mechanism - an "auto-regulative negative feedback loop" involving several genes. These genes give rise to a message (mRNA) and a protein that may cycle in a circadian manner. It acts either directly or indirectly as a transcription factor, inhibiting its own gene expression. It is found recently (in the 2010s) that there are regional clock genes within many organs that control its activity (Figure 10-17c). Disruption the working of these genes can cause various health problems as obesity, diatbetes, depression etc. of free-running rhythms of sleep and wake allowing them to forage whenever physical conditions are favourable. Where the circannual clocks reside in birds and mammals, or indeed whether there is an anatomical localization for the circannual machanism, remains an open question. 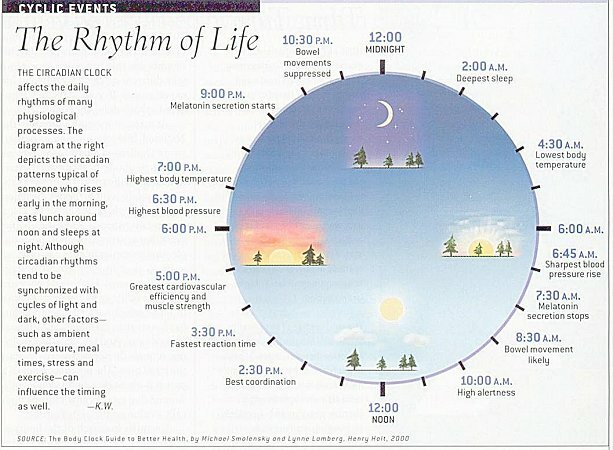 Experiments have shown that the circannual rhythms do not arise by just counting approximately 365 circadian cycles. One theory suggests that the triggering event is not the amount of light received by the organism, but critically depends on when it is received. In this view, there is a rhythm of light sensitivity that is entrained by dawn, and only when light falls at the proper phase or time after dawn will seasonal events be triggered. The photoperiodic machinery for the reproductive cycle in mammal and bird is illustrated in Figure 10-17f. In mammals, the melatonin is produced in the pineal and released into the blood, where it has a different profile under long and short photoperiods. 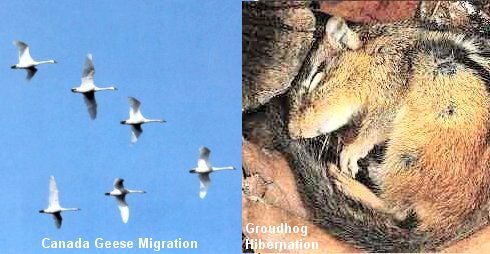 Under the long nights of winter, melatonin was found in the blood throughout the night, the animals were exposed to a long-duration melatonin signal, which plays a crucial role in the timing of reproductive activity. Figure 10-17f shows the effect of light (or the lack of it) propagating from the eye to the pineal (solid arrows). The duration of melatonin release from the pineal alters the activity of gonadotrophin-releasing hormone (GnRH) neurosecretory cells in the hypothalamus. These project to the pituitary (dotted lines) to release luteinising hormone (LH) and follicle-stimulates hormone (FSH). These hormones travel in the blood to the reproductive organs (gonads), where they stimulate reproductive activity and the release of testosterone and oestrogen. In birds, daylength is detected by deep-brain photoreceptors (DBP) and measured by a circadian clock in the SCN. Daylength information then regulates the activity of GnRH neurons in the hypothalamus. The rest of the process is similar to that for the mammals. The pineal and eye, so important in the circadian system of many birds, are not required for the photoperiodic regulation of reproduction. 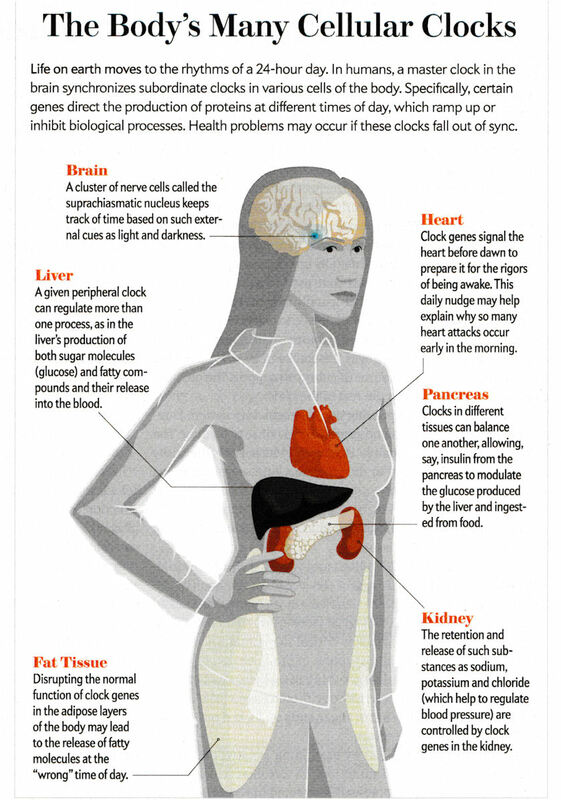 Recent research in 2003 points to another biological clock, which determines the life span of an organism. It is found that although the yeast cell normally goes through about 30 cell divisions in its five-day life span, DNA errors in daughter cells started appearing 100 times faster than normal after about 25 cell divisions - the equivalent of middle age in humans. 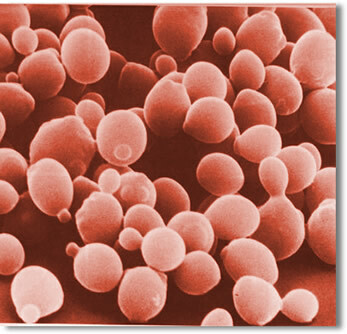 It is noticed that about 80 percent of cancers are diagnosed in people over 55. Since both yeasts and humans use similar mechanism for copying DNA, so the rapid accrual of mutations after midlife is probably not coincidental. It could have something to do with an accumulation of damaged proteins within the cell or with breakdown in the proteins that control DNA replication and repair or with damage in the DNA itself - there is no definite answer at this point. But there seems to be a powerful force in all cells that operates on its own clock with a predetermined expiration date (see also telomeres).